When I first moved to New York City in 1968, and for another ten years or so, the Greenwich Village Halloween Parade was a casual, friendly, neighborhood affair anyone could join. Accompanied by their parents, small children marched through the winding streets dressed up as ghosts and goblins and chocolate chip cookies while the locals, in costume or not, stood on the sidewalks and hung out of upper story windows to watch. The grand surprise, mixed in among the kids, was the magnificent drag queens, as gorgeous and statuesque as Las Vegas showgirls with their elaborate, sequined costumes and feathered head dresses they had undoubtedly worked on all year for that one night of display. Alas, nothing remains the same, and the Greenwich Village Halloween Parade degenerated into a highly-organized, professional production that has become notorious for drawing a quarter of a million drunks from the ‘burbs prowling the streets and puking on sidewalks. I learned to stay home. One Halloween about a dozen years ago, I was reading in bed when the front gate rattled followed by a horrendous crash against the door. Peeking out the window, I saw one of said drunks, either passed out or knocked out but definitely not conscious, leaning against the door. I pondered the problem. If I opened the door to shoo him away, the drunk would fall into my house. If I left him to sleep it off, I would be faced with the same difficulty if he was still there when I went out for my paper in the early morning. Hmmm. He had to go, I decided, but how? It wasn’t an emergency, so instead of 911, I phoned the main number of the Sixth Precinct and explained my problem, asking if a police officer or two could stop by to remove the drunk. I got his point so I went back to bed and resumed reading. About an hour later, I heard someone shouting my name. Peeking out the window again, I spied two friends who said they had been walking by, saw the drunk and asked if I wanted them to haul him away. Not meaning to throw cold water on anyone’s good time, I’ll admit that aside from the early days of the Village parade, Halloween doesn’t do much for me. It’s been four decades since I lived where kids trick or treat, and dressing up in a costume myself doesn’t thrill me now anymore than it did when I was a kid. Nevertheless, it is an ancient ritual that should be marked in some manner. So, although it has nothing to do with Halloween, here’s an odd little exercise I found while wasting time one recent evening following web links hither and yon. Try it. It’s really weird how it happens. Pretty cool. Silly, too. But I like picturing all of you twirling your foot and drawing air sixes to see if it's true. Just so we don’t ignore the holiday altogether, here is a photo I’ve published before. 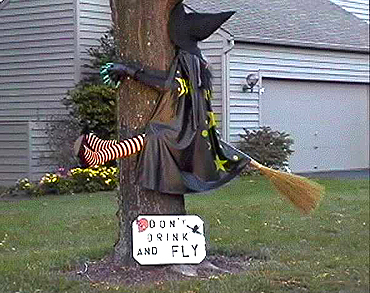 Many years after first discovering it, it’s still my favorite Halloween image. You’re probably grateful that Crabby Old Lady has restrained herself from ranting during this endless election campaign. As we reach the final four days until it is over at last (barring, god forbid, hanging chads or their electronic equivalent), Crabby has just one thing to say: Sarah Palin isn’t qualified to be anything more brain taxing than a beauty pageant judge. Even if Crabby were inclined to vote for Senator McCain (there are many good reasons not to), his choice of Palin as presidential place-holder is the number one deal breaker. Someone else said it first and Crabby agrees: McCain proved his unworthiness to lead the United States in his first important presidential decision - the cynical choice of this cute but vacant woman. Recent polls show that Governor Palin’s strongest supporters are white men. Without referencing the obvious reason (see end of paragraph 2), may Crabby Old Lady suggest that if you’ve got one of these at home, find something else for him to do on election day. By doing so, you could be responsible for saving the future of our country from worse than the past eight years. But that’s not why Crabby is breaking her silence today. She has two other items in mind – one is merely annoying; the other is terrifying. Links are the lifeblood of blogging, but no one will follow them without a reason, nor will they return to blogs so devoid of anything worth knowing. Crabby would like to report that it’s just kids who don’t know any better, but some big-time, popular bloggers along with a few elderbloggers are guilty too. All of them insult Crabby’s intelligence and waste her time. Always tell her - and all readers - what they can expect to find at the other end of a link. The first story Crabby read yesterday morning in The New York Times set off bells in her head that didn’t stop clanging all day. It tells of a new bio lab built on the Texas Gulf coast island of Galveston that was recently flattened by Hurricane Ike. Promoted by President George W. Bush, Senator Kay Bailey Hutchison and former House leader Tom Delay, the lab, run by the University of Texas, will study the world’s deadliest diseases, gruesome killers like the Ebola and Marburg viruses for which there is no known cure. Ike was a Category 2 (on a scale of 5) storm with high winds clocked at no more than 100 mph. What, Crabby wants to know, does a bio lab deputy director know about building construction and a structure’s ability to withstand hurricane-force winds? And what is the IQ of leaders such as the three who support this project? Bah! Until not so long ago, there was an urgency to many parts of my life. As is common to many young people, NOW! was the optimal timing for seeing a newly-released movie, finishing a book, buying the latest cool fashion item and adding another new city, state or country to my travel repertoire. Even housecleaning had a deadline. I operated on the assumption - although I didn’t think of it in such stark terms - that I might not be here tomorrow, so I had better meet my obligations and grab my pleasures while I could. Although there was no list to tick off, no specific goals to my forward urgency, I did have a sense that I was racking up points each time I finished a self-imposed “NOW! assignment.” Something had been accomplished. I was even in the game, if not ahead, but if I didn’t keep moving I might fall behind. Perhaps the pressure was genetic. Late in her life, my Great Aunt Edith told me that it wasn’t until she was 70 that she understood if she had something more interesting to do, housecleaning could be postponed because certainly the dirt would wait for her. It is a lesson that didn’t take me quite as long to learn as Aunt Edith. In the past few years, that long-familiar urgency has (mostly) evaporated and it is astonishing how long I can now tolerate dust in the corners. These days, I’m happy to wait for a new movie until it hits the cable channels. I no longer need to own the latest style in clothing and in fact, I don’t even know what’s fashionable anymore. Nor do I care. It feels good to have let go of the need to be au courant and speed through each week, but none of it makes sense to me. Why, I have wondered, just when my time left on Earth gets shorter by the day, do I feel I have plenty of time to finish that book, see that town in northern Maine someone recommended and get back to Paris or New York City for a visit? Now, I may have found an explanation for this paradox. Perhaps my rush to be done with one pursuit and get on to the next was to pile up experience, which is one of the jobs of the young. Sheltered by our parents through our teen years, we’re eager to get out and see the world on our own terms, to experience all the things that were forbidden in childhood and to discover our personal sensibilities. But after a few decades of that, it could be a matter of “been there, done that,” and of knowing how fleeting new things are, rarely more than passing cultural fancies that may collectively change the zeitgeist over time but are individually unimportant. I spent about six decades plagued by time - not enough of it. Although I’m not convinced yet that my recent explanation for the paradox of expanded time in old age holds water, it’s a less stressful way to live. Sometimes, nowadays, I can even let my mind wander where it will without reminding myself there is something I ought to be doing. In 1983 (along with her partner Cynthia Rich), Barbara MacDonald published a collection of essays titled Look Me in the Eye: Old Women, Aging and Ageism. With this slim book, MacDonald put the lesbian feminism movement of that time on notice: in carving out space for ourselves as lesbian women, we were ignoring, excluding, and rendering invisible the few old women around us - and the old women we ourselves would one day become. MacDonald insisted unequivocally that her ability to name the ageism she experienced derived from her life of knowing "otherness" as a lesbian in unsympathetic times. And she knew that experience was not something unique to lesbians. ”...these essays are about growing old...but they are about difference - about otherness - and all my life I have had to deal with difference, so old age does not come to me now as a stranger...It happened that I felt my difference because I was a lesbian. ”...again I was ‘other.’ Again I lived with the never-knowing when people would turn away from me, not because they had identified me as a lesbian, since I was no longer thought of as a sexual being, but because they identified me as old. Sometimes this was lonely, alienating. Angry as she was about what society did with her experience of aging, she sought to report honestly what aging meant to her. Barbara MacDonald died on June 15, 2000 at the age of 86. I had not thought of MacDonald's book in many years until Marian Van Eyk McCain of Elderwomanblog reminded me of it in comments on a previous Gay and Gray column. When I first encountered it, I was one of those youngish women among whom MacDonald was never sure she could find a place. Today I am almost as old as Barbara was when she began writing these essays. Reading it again was a profound experience I had hope I have succeeded in sharing here. Look Me in the Eye is presently out of print, so I have taken the liberty here of offering long quotations to share the flavor of what hold up well as a challenging work by a brave woman. Here’s a confession for you – I’m a wimp. One of the changes that has occurred as I’ve aged is an abhorrence of abuse so strong that I can barely read stories of such acts, whether deliberate or “merely” neglectful, against anyone or anything – children, elders, animals, even entire populations as in Iraq, Afghanistan and some African countries. I quickly turn the page when, for example, National Geographic publishes photos of birds and seals caught in oil spills. Lately, reports of people being evicted from their homes leave me distraught. Just the headline of a recent story about a beaten and starved child was enough for me to click to another page. That I apparently have no control over my reaction doesn’t make it less stupid. It is important to bear witness to wrongs that are perpetrated as much as it is to help when possible. I’m telling you about this because I suspect it accounts for the fact that in all the years of the existence of Time Goes By, I have never before written about elder abuse. I think about it, but I haven’t been able to dwell upon it long enough to write. "a single, or repeated act, or lack of appropriate action, occurring within any relationship where there is an expectation of trust which causes harm or distress to an older person." Physical abuse is physical force that results in bodily injury, pain, or impairment. It includes assault, battery, and inappropriate restraint. Sexual abuse is non-consensual sexual contact of any kind with an older person. Neglect is the failure of a caregiver to fulfill his or her care giving responsibilities. Self-neglect is failure to provide for one's own essential needs. “[Fifty-year-old Kathleen] Allmond and [30-year-old Tony] Ray then cremated Ramona [Allmond]'s body by burning in continuously using olive wood from the surrounding orchards for up to 17 hours, said TSCO. Elder abuse statistics are hard to come by because it is notoriously under-reported. Estimates of numbers of victims range from more a million people 65 every year to nearly two million. This Sunday post is a collection of links to elderblog stories about the issues that are important to understand in making our choices on who to vote for in the November election. You can read the original post announcing this feature here. From The Economist: What if the Whole World Could Vote for U.S. President? From Bailout Sleuth: The End of Bailout Transparency Already? So what if Barack Obama is a socialist (which he isn't)? He would be in good company: Mark Twain, H.G. Wells, Albert Einstein, Charles Chaplin, Bertrand Russell, Martin Luther King, Jr., Leo Tolstoy, Jack London. G.B. Shaw, George Orwell, Nelson Mandela. Well, you get the idea. Before socialism was perverted by the Soviet Union, it was seen by Einsten, as he wrote in 1949, an economic system the purpose of which was to "overcome and advance beyond the predatory phase of human development...Socialism is directed toward a social-ethical end." Noting that man is a social being, Einstein continued, he/she "can find meaning in life, short and perilous as it is, only through devoting himself to society...The economic anarchy of capitalist society as it exists today is, in my opinion, the real source of the evil." What does an old physicist know? But I doubt that politicians who toss the word around like an epithet know what Socialism is. And those who decry socialism often benefit from it. Take Republican Sen. John McCain, who spent years as part of a socialist endeavor, the United States Navy, which, of course, is publicly owned (although recently much of its work has been outsourced and privatized). As a public employee, he got free medical care; even the clothes on his back were government owned. When he returned from Vietnam, he was treated in military hospitals which are government owned. And he's gotten medical care at VA facilities; the VA, in which the doctors, nurses and other personnel work for the government is socialistic. He denounces government-run health care, which he, his father and grandfather have gotten all their lives. And McCain also gets Medicare; but it might comfort him to know, it is not socialist since the doctors and others work for themselves. In his new Gray Matters column today, Saul Friedman sheds some light on the changes in Medicare and explains how a means test for the Part B premium, which is deducted from Social Security benefits, will be fully phased in next year. Social Security, Medicare and “hell on our grandkids” are among the five ways R.W. Eskew says a McCain/Palin administration would make things worse for elders. More here. David Wolfe of Ageless Marketing has a terrific post about how much the internet has changed our lives. There is even, he tells us, a primitive version of the Star Trek food replicator. We are living through extraordinary times of political, economic and cultural storms, says David, but “Deconstruction has always preceded reconstruction in the long journey of human progress from the days of the first hand-wrought tools.” Read more here. From the beginning of the presidential campaign, we’ve been told that a majority of elders are voting for Senator McCain. Early voting in Florida belies this “fact” as does this story from Bloomberg.com. And the latest Gallup numbers tracking preferences by age now show elders have given Senator Obama a slight lead in their age group. Google has created a terrific, little tool to help you figure out how much money you can save and reduce your carbon footprint by changing some of your household energy behavior. According to their tool, I’m saving $368 a year and 5100 pounds of CO2. They have other energy saving tips here. Why are people who seek face lifts “embarrassed” or “depressed” by their appearance? Because we live in a culture that perpetuates negative beliefs about getting old – that elders are universally sick, impotent, senile, useless, isolated, poor and dependant. These beliefs are manifested every day through elder abuse, age discrimination in the workplace, criminal victimization, less aggressive health care, invisibility (particularly toward elder women) and generally patronizing behavior. "Like airlines that offer first-class and coach sections, dermatology is fast becoming a two-tier business in which higher-paying customers often receive greater pampering. In some dermatologists' offices, freer-spending cosmetic patients are given appointments more quickly than medical patients for whom health insurance pays fixed reimbursement fees. "In other offices, cosmetic patients spend more time with a doctor. And in still others, doctors employ a special receptionist, called a cosmetic concierge, for their beauty patients." That means someone who, according to The Patients Advocate, wants a face lift “just for a change” gets preferential treatment over another with, for example, a squamous cell cancer. Let me make my position clear: aside from disfigurement due to accident or disease, all cosmetic surgery is ageist and all who participate in it – physicians and patients – contribute to the common belief that old people are ugly resulting in the prejudice and discrimination Dr. Butler so succinctly describes. For the Oldest, Old Project, I asked bloggers and readers who are at least 80 years old to tell us “young ‘uns” how they and their lives have changed in the 20-plus years since they were 60. It has been a popular undertaking and today, Saul Friedman, who has been writing the weekly Gray Matters column for Newsday for more than a decade joins this group with an important admonition, at the bottom, for all elders. Others who are at least 80 are encouraged to send their stories. I was still immortal at 60, working up to 24 hours a day, impervious to pain or weariness, my immune system tossing off illness, my colleagues admiring of my work, my speed on the laptops we carried and my stamina. Also I had reached the top of my craft, journalism, covering, witnessing and writing about the great issues of our time. On May 31, 1988, I was among the knot of reporters who stood in Red Square with Ronald Reagan and Mikhail Gorbachev, and I asked the president whatever happened to the “evil empire?” He replied, in effect, that that era was over. Funny the things that you remember. I remember calling home and learning from my wife, who noticed such things, that the full moon that night would be the second of the month, a “blue moon,” which gave me a perfect lead for what the old cold warrior said and did that day. The following year, George H.W. Bush, whom I had known since I covered politics and he was the Republican county chairman in Houston, became president. And because I didn’t want to cover a president I had known as a friend, I headed for the job I really wanted, covering foreign affairs and the adventures of James Baker, who I also knew in Houston. And that’s what I was doing at 60, covering Baker and the cataclysmic events on his watch. In one of Baker’s early meetings with his Soviet counterpart, Foreign Minister Edward Sheverdnadze, the U.S. and we learned that the Soviets would no longer force the eastern nations to remain in the Warsaw Pact, which mean they were free to leave the Soviet orbit. Baker convinced a skeptical Bush that Gorbachev was a reformer. A little over a year later, in November of that momentous 1989, the Berlin War came down and the Cold War came to an end. I had been there in 1987, when Reagan, at the Brandenburg Gate implored Gorbachev to tear the wall down. I have an idea Reagan knew that was coming. Anyway, the disarmament talks that had begun with Reagan (when we got briefed by a bright and articulate young officer named Colin Powell) and became the START (Strategic Arms Reduction Treaty) and INF (Intermediate Nuclear Forces) agreements, which seems quaint now. The elder Bush, a signer, not a destroyer, concluded the treaties. Then came Saddam Hussein’s surprise invasion of Kuwait and the run up to war as Baker and his press entourage flitted around the world, putting together an unprecedented coalition, including Arab states, that was ready to support the U.S. if it went to war with Iraq. I was there that crazy night in Geneva when a last-minute effort to get Iraq to withdraw failed. No one in my office believed me when I told them there would be a war. During and after the run-up to war (which other nations paid for), Baker promised the U.S. allies (and Bush agreed) that American forces would not push into Baghdad. He told traveling reporters that the U.S. would become an occupying force in a dangerous environment. Besides, he had pledged to the Arab nations he would pressure Israel to come to a peace conference, which organized in Madrid. It was to be his last diplomatic triumph, for his old Houston friendship with Bush forced him to quit the State Department to run, without enthusiasm, the elder Bush’s unsuccessful re-election campaign. And a few years later, when Baker was gone, the Soviet Union was gone, and world affairs were no longer as newsy, I had to find other things to do. I was no longer immortal and that came to me, after chest pains from exhaustion and a terrible stomach upset on the way home from Syria. That’s when I founded my column, “Gray Matters,” (my wife helped name it), as a survival guide for people growing older in a time when their numbers are fast growing, but the hostility of government towards older Americans is also growing. I discovered quickly that the business of growing older is complex, what with Medicare, Medicaid, long term care, Social Security and scores of retirement and elder law issues. But, like Time Goes By, no subject is ignored. It was necessary I write this column, for I am a reporter and that’s what I do. And I’ve kept at it for my own survival through a stroke and cancer, which I told my readers about. Indeed I’ve told my readers, unless you were a shoe salesman hating what you did, keep doing it. All of us can use your experience. There are too many young people on the news who were born the day before yesterday and could not possible know what you and I know. I remember what it was like for my mother and mother-in-law when they got sick before Medicare. Do the young know there were poorhouses before Social Security? Anyway, after I wrote my first column about a woman who was forced to put her husband in a nursing home and wondered how she could afford to live, I was thunderstruck. I explained her rights under Medicaid. And I got dozens of letters from people asking the same question. It was more mail, by far, than for any of my cosmic stories on war and peace. “At the same time, other parts of the economy are closing in around [61-year-old Corlette McShea]. Though her home is paid off, her property taxes have risen to nearly $14,000 a year, up from $5,000 when she bought the house 10 years ago…. “Senior citizen nutrition centers and food programs in Illinois are at risk of closing or reducing services as prices for food and gas skyrocket. I’d like to hear from Congressional and presidential candidates about plans to help old people who have few resources to see them through this recession. As Mr. Baily, above, points out, many will never recover. Meanwhile, those of us who are getting by need to contribute money and/or time to our local food banks and delivery services. Although enrollment does not begin until 15 November, the Medicare website has just published the Prescription Drug Plans (Part D) available for 2009, and in my case, it is a shocker. The monthly premium for my current coverage plan increases (are you ready?) by 221.4 percent. No, that is not a typo. And, according to the calculations on the Medicare site, the co-pay for my single prescription drug at the pharmacy will increase by 160 percent, averaging out to an increase (assuming no additional drugs during 2009) of 186.6 percent. My current carrier is in the top five, so I’m curious to know what the researchers at Avalere Health are smoking. NOT in the state of the Maine! The least expensive plan available to me for 2009, including both monthly premium and pharmacy co-pay, costs 75 percent more than my current plan – a helluva lot cheaper than 186.6 percent, but still off the charts in terms of what the insurance and pharmaceutical companies are raking in. That’s a deceptive fact. In Maine, while there is one such plan for 2009, the high co-pay for the drug I take and a high deductible, make it much more expensive annually than a couple of other plans with higher premiums. So when you review your coverage for next year, don’t rely only on the monthly premium - it is important to also compare co-pays and deductibles to keep your increase as low as possible. Fortunately, the Medicare Part D website makes comparison relatively easy. Be sure, on page 2, to scroll down to the area on the bottom left of the screen where you can click on “View your current plan.” This will show you the premium and other costs for 2009, and allow you to plug in the drugs you use. You can then compare your current plan to other plans in your state which can vary even from county to county. There are an enormous number of Part D plans in each state – 46 in Maine – but by using the version that allows you to include your drugs in the search, you can reduce the number to plans pertinent to your circumstance. It is outrageous that premiums can be allowed increase more than 200 percent in a year. With only one drug, my cost is not a lot in dollars, but that huge percentage can make a difference, to people who use several and/or more expensive drugs, between affording drugs and not . Enrollment for a new Part D plan begins on 15 October and continues until the end of the year. You can save yourself a rush during holiday season by starting now. I’ve tentatively chosen my new carrier - which will increase my costs over this year by "only" 34 percent - although I’m waiting until Medicare posts consumer ratings, which hasn’t been done yet, to confirm the change for myself. If you choose to keep your current Part D plan, you need to do nothing. The problem of unconscionable price increases (not to mention the hassle of researching and changing carriers each year) is due to unregulated, for-profit insurers and that, unlike Medicaid and the Veterans Administration, by law, Medicare is not allowed to negotiate prices with the pharmaceutical companies. Thank the Republican Congress for that, and for the doughnut hole too. Although Congress and not presidents make law, Senator Obama has made it part of his platform to work for negotiable drug prices within Medicare if he is elected. The only hope we have of containing annual, astronomical price increases for in the prescription drug program is to elect Obama president. When I was growing up and for a long time into my young adulthood, ordinary, middle-class people did not generally invest in the stock market. That was a game for rich people and until the mid-1970s, there were no IRA and 401(k) retirement savings programs. It took a few more years after their creation before those plans became commonplace, so many working stiffs didn’t pay attention to the stock market for another decade or more. In the 1990s, stock trading arrived for everyone, and online brokerages made it easy. When I would sometimes join my internet colleagues for drinks after work, all the talk among those 20-somethings – they were all 20-somethings but me – centered around comparisons of the killings they were making with online trades. One might say, “I cashed out (stock name) after my profits hit 400 percent and I put it all in (stock name).” Another would one-up him or her saying, “I let mine ride for a few more weeks until it hit 600 percent.” Others would tout the stocks of companies where friends worked. I would sit there listening, amazed at how cavalier these kids were about dumping hundreds, sometimes thousands of dollars into new companies (they were always tech or internet stocks) with, apparently, little knowledge or understanding of the businesses they were investing in or their prospects for future growth. Undoubtedly they thought (although they were polite enough to not say it) I was an old fogey stuck in her old-fashioned ways. Once or twice, I mentioned the Great Depression, getting only blank stares in return. (What ARE we teaching kids in school these days?) If they had heard of it, I suspect they believed it was ancient history that had no relevance in the final decade of the 20th century. Then, in 2000, the dotcom bubble burst and all those young people lost a lot, many all, of their money. Investments of all kinds always go up - and, they always go down. My apartment in New York City’s West Village was so charming and located on such a beautiful street that never, in 25 years of ownership, did a month pass without an unsolicited offer to buy it. During the recession of the early 1990s, one offer was 20 percent below the price I had paid in 1983 - about right for the market at the time. I didn’t care. I wasn’t interested in selling and at age 50 or so, I had the time to ride out that Manhattan real estate dip. When I did sell in 2006, although there were already unnerving intimations of the coming housing decline, I got out under the wire and made an excellent profit. There have been numerous recessions, downturns and, conversely, bull markets in my life and it didn’t take any effort or certainly no special knowledge on my part to learn from them that nothing goes up forever. Nevertheless, against all historical evidence that even a financial dolt like I can see, Wall Street “experts," supposedly smart people touted as masters of the universe with advanced degrees from Harvard and Yale, believed prices would never drop. These are the same people – one named Henry Paulson - who are now being paid taxpayer big bucks to run the bailout of the banks. One of them, hired by Paulson to oversee the Troubled Asset Relief Program, was about the same age as my exuberant young colleagues back in the days of the dotcom bubble. What other irrational ideas, I wonder, do these people believe in now, and are Senators Barack Obama and John McCain, whichever becomes president, gullible enough to believe in them too? From Linda Hillin: Remember Nixon? “It's pathetic to hear right-wing talk radio blowhards try to associate Barack Obama with ‘radical’ or ‘socialist’ views when a Republican administration is tossing aside Atlas Shrugged and speed-reading Das Kapital." Ralph Bernstein joined the Peace Corps and is now working in Ghana. No big deal, except that he is 84 years old. The Peace Corps says applications from people 50 and older have jumped nine percent in the past year and they have now created a special website for elders who are thinking of volunteering. More here and at the 50-Plus Peace Corps site. Twenty-three percent of people between the ages of 65 and 74 are still working, some because they choose to and other because they need to – the latter group will undoubtedly increase now due to the economic crisis. But as this story points out, age discrimination ensures that too many can’t find work in their fields and wind up wasting their talent and years of experience as greeters, crossing guards and grocery baggers. Here another Australian elder doing terrific things: Joseph Ciampa has been award a PhD in Spanish literature - at age 91. Dr. Ciampa isn’t resting on his laurels. Now he “intends to go on to do a masters degree on the philosophers Chomsky and Wittgenstein.” More here (and another hat tip to Peter Tibbles). "A simple, everyday task like searching the Web appears to enhance brain circuitry in older adults, demonstrating that our brains are sensitive and can continue to learn as we grow older." At first, when I started watching the video below forwarded by Millie Garfield’s son Steve of Off on a Tangent, I thought, “What the…” But then it got funny. And funnier. It also makes an important point about next February’s switch to digital television that non-geeks of any age can appreciate. I haven’t figured out how to vote yet and, obviously, neither has anyone else. 1. If you reject the professional (and amateur) pundits' simplistic game of calling the debate as a horse race, it was the best of the three because the candidates discussed issues that matter and showed real differences between them - side by side. 2. Senator McCain said that Americans are angry, but I think he misreads the national mood. Anxiety is more like it. Anxiety tinged with fear over personal finances, jobs and homes along with how deep and enduring this recession will become. Senator Obama appears to understand that. Perhaps a man who has lived high off his wife's wealth for decades and has the best health care coverage in America for life can't understand how the rest of us live. "But it's not going to be easy. It's not going to be quick. It is going to be requiring all of us - Democrats, Republicans, independents - to come together and to renew a spirit of sacrifice and service and responsibility." You know that. I know that. And it's a relief to hear an honest assessment of our predicament rather than the discredited Republican refrain of lower taxes = better times for everyone. 4. During the discussion on abortion, I was offended by Senator McCain's mocking of the pregnant women's health, and heartened by Senator Obama's statement that abortion should remain (by upholding Roe v. Wade) a private matter among a woman, her family and her physician. 5. Regarding demeanor, Senator McCain's constant, rapid eye-blinking was painfully distracting. I'm sure psychologists can invest the behavior with some underlying meaning, but it made me feel jumpy, uncomfortable and distrustful. The value of debates is in seeing and hearing the candidates together: weighing their words, assessing their overall behavior under pressure and watching their reactions to each other. In the future, I would like to see all debates broadcast in split screen throughout. The annual Social Security cost-of-living-adjustment (COLA), which was announced yesterday, is not made on whim by some bureaucrat rolling dice. There is an established formula related to the Consumer Price Index that, for 2009, results in a 5.8 percent increase, the largest in several years. Although I believe the increase is way below what real inflation is (an explanation is too tedious for me to write and for you to read) and the average rise will not come close to covering increased expenses, it's better than losing ground and additionally, this year, it won't be negatively offset by an increase in the Medicare Part B premium which remains at $96.40. I doubt, however, that the increase will make up for lower investment dividends many elders are facing, income they have depended on in the past to supplement Social Security. If you want to know how much your Social Security payment will increase, track down your benefits statement from last November, take the "monthly benefit before deductions" number and multiply by .058. A letter confirming your increase will arrive from the Social Security Administration in mid-November. This is the new national conversation. Last week we met some friends for burgers. We looked forward to the low-key evening. How are your kids doing? Grandchildren? Any trips planned? Do you think you’ll go back to work? Should Brad Childress get fired? How about those ‘Horns. Often (at our age), the big question is how’s your health? Not this time. Almost immediately, the conversation jumped into the economy. Bam. One son has not been able to find steady work for a year, is divorced, and living in his parent’s home. Bam. Another adult child is having a difficult time getting pre-approved for a home loan. Bam. The ten-year-old van needs replaced but it is worth very little as a trade-in and credit is very expensive - if you can find anybody who has money to lend. Bam. One guy wants to sell his business but the economic slowdown has caused the value of the business to drop to near nothing. Bam. A friend has seen her retirement savings shrink by 40 percent in a matter of days. The funds took a life-time to build. Not once did anyone mention the presidential election, nor either candidate, nor either political party. Not once. Our problems are real. Our problems are bigger than politics. I wish our politicians were. Like one of George's friends, my retirement savings, meant to pay for my care if I become disabled or otherwise incapable of caring for myself, is down by 30 percent, mostly due to a Lehman Brothers bond (don't get me started on how pissed off I am that the government bailed out other investment firms, but not Lehman). I cannot imagine how I will ever make up that 30 percent difference, no what it will mean should I ever need that money. What about you. How hard and in what ways have you been hit by the economic crisis? Please feel free to post comments anonymously today if you would rather not reveal personal details with your name. As I told a blog friend by email early yesterday morning, I'm going to be tense until the winner of the presidential race is known. This is the most important election in our lifetimes with clear divide between the candidates. Although the next four years will be difficult times no matter who is president, the consequences of living in a country (and world) led by John McCain and Sarah Palin worry me pretty much all day every day. To the detriment of everything else I should be doing, I spend literally hours each day reading political news and analysis all over the web punctuated with bouts of staring into space while contemplating more issues than any one person can reasonably track without a lot of smart advisers. Is anything right with this country? I don’t think so. That Senator Obama is ahead in the polls gives me no solace. He is leading, I believe, because the economic crisis of the past few weeks finally focused voters’ attention on the differences between the two candidates and Obama has been solidly grounded throughout, while Senator McCain leaps from stunt to Plan A to Plan B and back so frequently a voter could get whiplash trying to make sense of him. Meanwhile, Governor Palin seems to relish her role of pit bull, stringing together meaningless Republican slogans without a glimmer of thought behind those pretty doe eyes. But I disagree with the pundits who say it's all over for McCain. I worry Obama's lead is tentative and superficial. That if McCain calms down, if his campaign controls Palin better and if McCain is only almost coherent in the debate tonight, the election could swing his way. And there is that other worry: I saw a white woman interviewed on a cable news channel saying, “I won’t vote for Obama because his skin color is not the same as mine.” I fear too many Americans agree with her. I desperately hope I am wrong. Although it is issues I care about most, on the subject of inexperience, which the Republicans have beaten Senator Obama with for months, I think the proof of his executive capabilities is obvious in the management of his campaign over the past two years. Unlike the McCain's, there have been no announcements made and later withdrawn, no wild policy swings, no contradictions among surrogates, no melodramatic, prima donna stunts - just a steady building of well-developed ideas and proposals. I feel confident with Senator Obama as president that he won’t rush off half-cocked when surprise events , domestic and international (and they will happen), present themselves. Plus, he is wise enough to not make promises he cannot keep – like balancing the federal budget by the end of a first term. Some Maine communities allow anyone to vote by absentee ballot whether they are absent at the moment or not. Since there is nothing that can change my mind in the next three weeks, I voted yesterday and mailed off my ballot. I thought it might release the tension I feel, but now I know that’s not going to happen until 4, or maybe 5 November when the votes in this long presidential campaign are finally counted. There is no getting around it – one of the things involved with “what it’s really like to get old” is that it becomes more likely bad things will happen with our own health and/or the health of people we know and love. “I felt as if I’d been slapped. In fact, I actually tried to get a look at the name on the case file the doctor had open while he was talking to us because I was convinced there was some mistake. Surely the message he was giving us was intended for someone else. But no luck on that one. “My new role, I think, is that of bad cop. Marge did a lot more than she should have today, and she even fooled me about how much energy she had. She looks so much herself that we've all assumed she was a lot stronger than she probably actually is. “So now I'm feeling protective. The blogosphere – and the elder blogosphere in particular – is a remarkably caring place. We have often discussed how close and important our online friends become and when bad things happen, our community has always jumped in with all the support it has in it collective heart - no less so than with those we know in person, just at a distance of the keyboard. Sometimes, however, we are reluctant to let our blog friends know when bad things happen. But it is better, I think, to reach out as Pete has done. It keeps caring friends close and I suspect the writing helps Pete too. It is a relief that Marge is home and doing well. 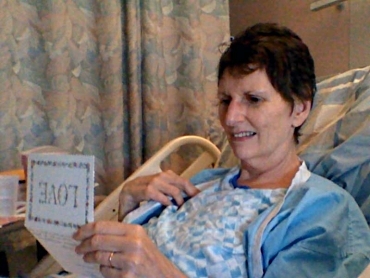 Here’s a photo of her toward the end of her hospital stay that Pete posted on his CaringBridge site - where you can leave messages under the “guestbook” link at the top of the page. The nuts and bolts of Time Goes By have needed care and repair for some time. There is still more to do, but I have spent a few hours under the hood tidying some sloppy markup that was causing problems and updating a couple of lists. It’s embarrassing that some of the additions to the Geezer Flicks list have been waiting since February to be included. Here are the 12 new films suggested by readers which are marked with a NEW symbol on the list page. Titles there link to further information at the Internet Movie Database. Thank you to everyone who took the time to email these. Suggestions are welcome – guidelines are on the Geezer Flicks page which is always available from the right sidebar. It has been too long since the Elderbloggers List (on the left sidebar) was last updated. I was surprised to find many blogs on the wait list that have not been updated for several months. Among the criteria for inclusion is that a blog publish new material at least once a week. Other requirements are listed in the FAQ which is linked at the upper left sidebar. I’ve also eliminated the links to reviews of elderblogs we have done in the past. I still like the idea, but it’s so @#$%*^! tedious to update this list by hand that I decided to simplify the code so not to go blind each time I add blogs. For the same reason, I’ve omitted the symbol indicating a blog is new to the list - all of which makes the list less cluttered-looking and easier to use. The newly added blogs are in alphabetical order below. Recommendations for new elderblogs are always welcome – your own, or others you’ve found that you like. Criteria are in the FAQ mentioned above. So here are the 25 new elderblogs, bringing the total on the list to 339. Some were launched in the past few months; some have been around awhile and are new only to me. Do visit their blogs, give them a hearty welcome to the world of elderblogging. Speaking of Saul Friedman, whose syndicated column runs in Newsday and elsewhere on Saturdays, I neglected to include his most recent column in the Sunday Election Issues post. You will find it here: Elders' Self-Interest is to Vote For Obama. From Elaine Frankonis of Kalilily Time: Is the 2nd American Revolution Almost Here? From Cynthia Samuels: Scary Times: Do We Face a New Great Depression (and Does Sarah Palin Still Matter)? Yesterday, we published a puzzle from a newly reissued 1947 book, Fabulous Fun with Puzzles.